ONLINE APPLICATION:- For the first time, it has been decided that the nomination for the National Youth Awards (NYA) should be received and processed through online mode, on the lines of the Padma Awards announced by the Prime Minister recently, to cover the people on pan-India basis. Earlier, the nominations were received only through State/UT Governments with the restriction that they should nominate only 5 names for Individuals and 2 nominations in Voluntary Organizations Category. It was a routine affair and no adequate publicity was given by the State Governments/UTs to popularize the Awards and seek varied nominations. In contrast, an applicant can apply now online directly to the Ministry on the recommendation of the Head of the Institution/SDM/DM/DC, or any officer, not below the rank of Deputy Secretary in the Government of India. An online application has been developed in consultation with MyGov team. Applicants will be given 30 days to apply online at https://innovate.mygov.in/national-youth-award/. The final selection will be made by the 8-member Central Selection Committee, headed by the Secretary, Department of Youth Affairs and prominent and eminent personalities. It will now be ensured that the selection process is transparent and the restrictions in the nomination process are removed, thus making the Awards more broad-based and accessible to the deserving youth of the country. 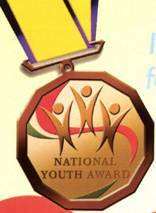 A new Logo for the National Youth Awards has also been released. Earlier, only one Award was given under Voluntary Organization Category, working with the youth for national development and social service. The number of Awards in the Organization category has now been increased from 1 to 10 and the prize money is Rs. 2,00,000 with a Trophy and Certificate. This initiative has been taken with a view that more recognition needs to be given to voluntary Organizations working in the field of Youth development, keeping in view of the number of organizations working in the country. Further, these outstanding organizations will be partners in promotion of the different schemes and policies of the Ministry in the field of youth development in the country. The initiative is expected to expand the reach of the Ministry in programme implementation across the country. The amount of money for the Award in the Individual category has also been enhanced to Rs. 50,000/- and will be given to 25 individuals. The NYA was earlier conferred for excellent work in the field of youth development activities and social service without specifying the individual fields thereby making it more general and less focused. It has also been decided that in line with the focused approach of the Padma Award, the NYA should also be conferred for excellent work done in the specific field of activities by the Youth. Accordingly, the field of activities for conferring the NYA has been categorically specified in order to have concentrated effort in those fields. The fields of activities in the course of youth development work are health, research and innovation, culture, promotion of human rights, art and literature, tourism, traditional medicines, active citizenship, community service, sports and academic excellence & smart learning and any other similar field. In order to address the drawback of limited awareness of the NYA, it has been decided that a pan-India colour advertisement, seeking nominations for the Awards should be released in all the major and regional newspapers. Also the advertisements will be put on Mygov portal and Ministry’s website. The advertisements inviting nominations for the award will be released on May 10, 2017. This initiative, combined with the online application, will be a game-changer for the NYA. National Youth Award is conferred on young men and women and voluntary organization every year in recognition of their outstanding work in the field of national development and social service. To motivate young persons (aged between 15 – 29 years) to achieve excellence in the field of national development or social service. To encourage young people to develop a sense of responsibility to the community and thus to improve their own personal potential as good citizens. To give recognition to the outstanding work done by voluntary organizations working with the youth for national development and / or social service. The award shall be given for identifiable excellent work for youth in different fields of development activities and social service such as health, research and innovation, culture, promotion of human rights, art and literature, tourism, traditional medicine, active citizenship, community service, sports and academic excellence & smart learning. Individual Award: Medal, Certificate & Rs. 50,000/- cash. Award to Voluntary Youth Organizations: Trophy, Certificate & Rs. 2,00,000/- cash. The individuals will receive the award in their traditional attire. He/She should be between the ages of 15 – 29 years as on 1st January of the current year at the time of nomination. He/She should have done extra-ordinary identifiable social work. The award will be conferred once in a lifetime. Participant is to make sure that his/her MyGov profile is accurate and updated since Department of Youth Affairs would be using this for further communication. This includes details such as name, photo and phone number. Entries with incomplete profiles would not be considered. Should not have been conferred with this award earlier. The applicant has to sign on white paper with Black Ink pen. The signature must be signed only by the applicant and not by any other person. Dimensions 140 x 60 pixels (preferred). Size of file should be between 10kb – 20kb. Ensure that the size of the scanned image is not more than 20KB. The Selection Committee will be vested with powers to select suo-moto any candidate for being considered for the award.